Imagine if Agnetha Fältskog's daughter were in Abba tribute band Björn Again or entertain, if you will, the idea that Julian Lennon performed with The Bootleg Beatles. It would probably turn either of those acts into The Best Tribute Band Ever. Last year, Frank Zappa's son Ian Donald Calvin Euclid Zappa or, more famously, Dweezil took his father's music on a short UK tour including a Zappa Plays Zappa concert as part of the Roundhouse's 70th birthday celebrations for Frank Zappa. Dweezil Zappa taking his dad's music on tour was always going to be a bit of a gamble; allegations of 'cashing in' never far away. But it turned out that not only was Dweezil's status as a musician worthy of his father's music confirmed, he is also, it transpired, one of his biggest fans. Disciples of Frank Zappa were rewarded with a highly-acclaimed, authentic and affectionate retelling of some of his best works. On the back of this success, Dweezil is bringing Zappa Plays Zappa back to the UK in November and December 2011 for a 13-date UK tour. Dweezil says: "Not only will we be performing with Frank once again via the technological wonderment of enhanced video during the live performance, but we will also be performing the works from one of his most well known albums. That's right, 'Apostrophe', played in its album running order. It's always been one of my favourites and it's certainly a fan favourite as well." 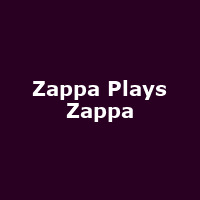 As Zappa Jr hints, the performance will feature a section in which Frank himself will perform with the band via synchronized audio/video technology using unreleased video footage. Now that's a tribute. The tour kicks off at the York Barbican on Thursday 17th York, taking in The Sage, Gateshead (18/11), Manchester's Bridgewater Hall (22/11), Leicester's De Montfort Hall (27/11) and teh London Barbican (29/11), among others. The tour closes at the Dome, Brighton on 1st December. Tickets are on sale now from £24.50 (from £10 at Liverpool Philharmonic on 21/11).